I got this card for my birthday two years ago. A colleague had gone out to the papeterie next to our workplace during her breaktime. When she came back she handed me an envelope with, inside it, this cute card. She said it reminded her of me. I look Asian. I know that’s a vague affirmation, but that’s what people think when they first see me. I have a round face, a small button shaped nose, dark brown hair and almond shaped eyes. When I meet someone, I know they’ll eventually ask me where I’m from. For some, it’ll come soon after we are acquainted, where as for others, it will take more time. One friend tells me now that she first thought it was a sensitive subject since I didn’t bring it up myself so she was afraid to ask. It isn’t. The whole truth: I’m the product of many mixes like most people. On my mother’s side everyone has been Canadian for multiple generations and on my dad’s side I have an Italian grandpa and a Canadian grandma. So where do those almond shaped eyes come from? The most plausible explanation is that someone, somewhere along the line, was a native American. We don’t know for sure and haven’t bothered to check, but it’s what’s most likely. ‘No, that’s impossible’. I’d shake the thought off instantly. Over time, I noticed that I’d inherited the same body shape that my dad’s sisters had, as well as his hair and my mom’s delicate features, so I felt reassured. For other people though, it isn’t so clear. Just last week my downstairs neighbor asked my boyfriend if I was Japanese. I wish! I’ve also been mistaken for a latina girl by a flirty counter guy at the Dominican bakery close to my former apartment. He addressed me in Spanish, and when I looked at him, confused, he said ‘You’re not latina?’. ‘No.’ I replied.. ‘Really?’ He asked, seeming doubtful. When people ask ‘the question’, most times I’ll tell them to guess. It creates so many possibilities and I love hearing people’s perception when they see someone that looks different enough to them that they’ll enquire about their origin, whilst still seeming local. I’m lucky, I’ve never felt racism because of my features (language is another question but that’s a whole other subject to write about). Once, a kid in elementary school called me a stupid Chinese girl but that hardly counts. Most times people will think that I’m Vietnamese, Chinese or Korean. My boyfriend, on our first date, guessed that I was Mongolian (no joke!). I love to hear all the possibilities of what I could be in the eyes of someone else. Sometimes I’ll even play with that idea a little bit before disclosing the truth to the person I’m with. Like I said before, I myself don’t know all the elements of the truth. I have no idea where this native blood fits into the genealogy of my family. One day, if I have time and money to spend on that type of research I’ll do it. For now, I like not knowing. It kind of makes it more exciting to keep things mysterious. Who knows what’s real? Does it matter? Will knowing the full truth change my identity or my view of the world? In 2009 I traveled to Rome with my boyfriend. 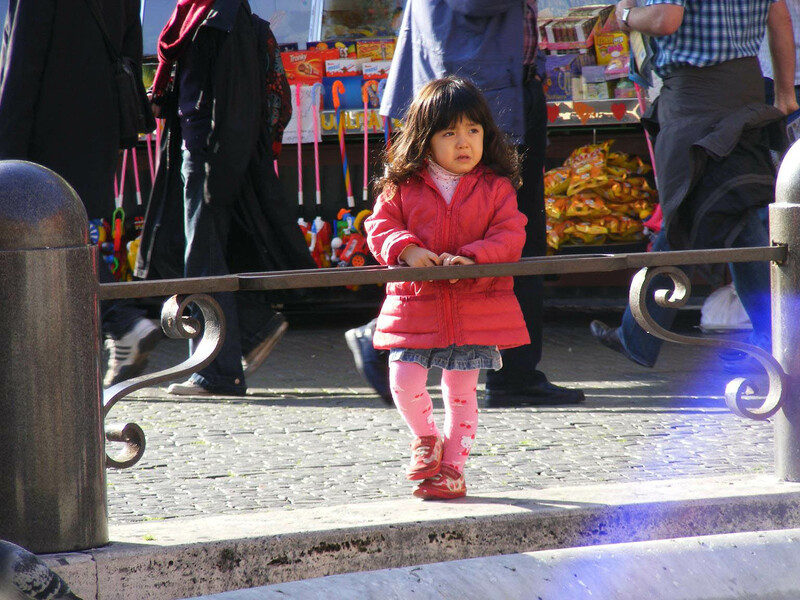 We were people-watching at the piazza navona, when suddenly I saw this little girl, about 3 years old, playing with the pigeons. She was the spitting image of me at the same age, face, haircut, colorful clothes and all. When the pigeons stopped being friendly, she started crying and her parents came to comfort her. That’s when we realized that her father was Chinese and her mother Caucasian. Interesting! I wonder if, wherever she lives, she’ll be faced with the same question over and over again, like I am. I hope if she is, she’ll have fun blurring the lines of her identity like I do! Little Japanese girl, little Chinese girl, little Italian girl, little Léa…. 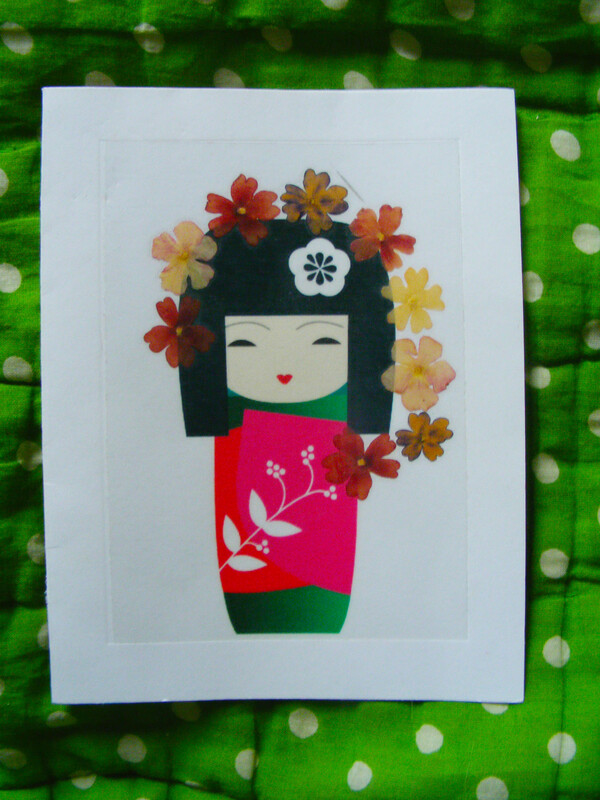 This entry was posted in Art, The bedroom and tagged almond shaped eyes, birthday card, cute birthday card, little japanese girl, mix raced on 15 July 2012 by lapetitelea. Thanks Sara! I’ve checked it out and I am definitely interested. I don’t have the money right now but it’s something I could envision participating in within the next few years.